This is an experimental laboratory in which we use the body as a means of interaction and creation in real time to the scene. During the five days we inquire through the use of non-proprietary software, technology devices such as sensors, cameras, controllers and practical way to experience the performative creation. During the five days long workshop, in daily meetings of three hours each, we explore the world of possibilities provided by the new technologies in relation to the body, movement and performative creation. 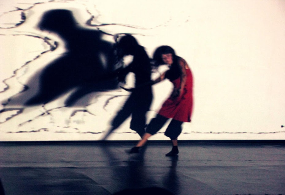 Although the workshop is not intended to generate a performance as final work, an important part will be devoted to personal and collective creation. During this module the human-machine relationship and the principles of the quality movement as performative process behind the technology of motion tracking and sensor data is explored. During this module we play with the rational interpretation of the movements, synchronized event and the use of mobile devices (and others) to control the performative space. We work on the area of intersection between different disciplines with a special focus on art, science and technology. We alternates the work with software to the one with body proposing different interaction tests. We stimulates the autonomous search from the technical concepts shared during the workshop. Participants are invited to bring relevant examples and practical issues related to the lab topic. – open space where 20 people can do physical exercises comfortably. The lab is open to artists working with new media, dancers, performers, video artists, actors and all those people who want to develop a body work in relation to technology. No prior knowledge of computers is necessary but an experience with real-time audio-visual technologies is desired.